This week, you will be implementing inheritance by creating a generic Racer superclass along with two subclasses called StreetTuner and HotRod. You will make the Racer class abstract and include the abstract method IsDead in the Racer class. •	Zip the project folder. Build the class structure shown in the UML diagram. Remember to include getters and setters for each class attribute. 2. For the isDead method in HotRod, use the logic below to implement the inherited base class abstract method called isDead. 2. For the isDead() method in StreetTuner, use the logic below to implement the inherited base class abstract method called isDead. Hint: When completing the Main Class for your lab, feel free to reuse old methods from previous labs! 1. Create an array of Racer objects that will hold three Racer objects. 2. 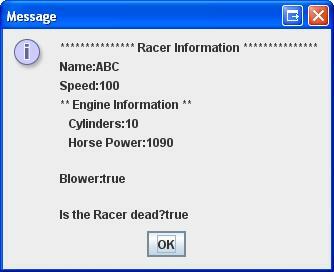 Write a method, called collectRacerInformation that accepts as an argument a Racer object, and then prompts the user to provide the following information for each racer. 3. 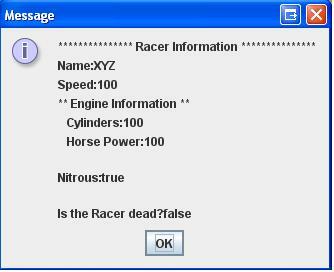 Add logic to collectRacerInformation to determine if the Racer object passed in is a HotRod or a StreetTuner. If it is a HotRod, prompt the user to indicate the existence of a blower. If the object is a StreetTuner, prompt the user to indicate the existence of nitrous. Set these values appropriately. 4. Write a method called displayRacerInformation that accepts as an argument a Racer object, and then displays all the information for the specific racer type. 5. Create any combination of Racer objects (make sure you create at least one StreetTuner and one HotRod) and invoke collectRacerInformation, passing in each of the Racer objects. Store each object in the array. For StreetTuner objects, be sure to set the nitrous flag (either true or false), and for the HotRod objects set the blower flag (either true or false). 6. Iterate through the racer array and, for each Racer object, display all the object’s attribute information (call the displayRacerInformation method for each object). Don’t forget to indicate whether or not the Racer is dead!